It is hard for developers to know which OS (Operating System) to choose when developing an app. Usually, they hesitate between Android or iOS systems. Some people tend to think that an app will be more spread on Android as it is leading the market. Nevertheless, many key factors have to be taken into account to make the best decision. Throughout this article, we are going to explore several important points to consider when choosing an operating system. We will be focusing on Android and iOS as they are the largest OS developed. However, it is important not to forget that other systems exist and that they are evolving in certain markets. As a matter of fact, Android is the operating system with the biggest market share. In Q3 2013, the leader was way ahead iOS with 81.9% against 12%. Microsoft was third with 3.6% of market share, not far from RIM (BlackBerry operating system). In the U.S., Android and iOS devices’ market shares were closer with respectively 50.6% and 43.9% Q3 2013. A first factor that may influence a developer decision is the penetration of the operating systems in the countries that he is targeting. Why has the Apple App Store so many downloads? We’ve seen that Android was by far leading the market… However, despite the large difference between Apple and Android market shares, there is no big gap between the number of available applications on the two stores. Same for the amount of downloaded applications. If we compare iOS and Android figures in early 2013, these have respectively around 900,000 and 800,000 available applications on their stores. iOS counted 48 billion downloads and Android 50 billion. Android seems however to have taken the lead. In Q1 2014, Google Play exceeds Apple App Store downloads by 45%. In addition, Android users can download apps on the Amazon Store. However, the amount of these downloads is much smaller than on Google Play. So, how can we explain these figures? Why is Apple driving so much downloads while having only a small part of the market share? The Apple App Store has the big advantage of being the first. It was launched few months ahead of the others. Indeed, Apple unveiled its App Store in July 2008 while Android launched its store in October the same year. Blackberry App World went live in April 2009. By the end of 2009, Android had only 20,000 applications available against 100,000 for Apple. Many smartphones running on Android have poor operating systems and therefore their users are less likely to download applications on their smartphones. There is indeed a wide range of Android smartphones on the market with different quality. For example, the Samsung S5301 Galaxy Pocket PLUS Black, which is sold at an average price of $70, is still considered as a smartphone despite its lower quality. However, people unlikely use it to download applications due its low-power hardware and its small screen. On the other hand, all iOS devices are offering great processors enabling users to download any app they want very easily. That’s also why their prices are on average higher than other smartphones. 2. Apple: the best way to monetize your app? Apple remains the best App Store in the U.S. to monetize an application, according to a report from the U.S. market (April 2013) revealing the 200 most profitable applications. Google Play’s daily income was around 1.1 million against 5.1 million for the App Store. Actually, in Q1 2014, Apple’s App Store led Android in terms of app revenue by 85%. Apple App Store dominance in income revenue can partly be explained by its users behaviors. They are actually more likely to pay for applications than users from other services. 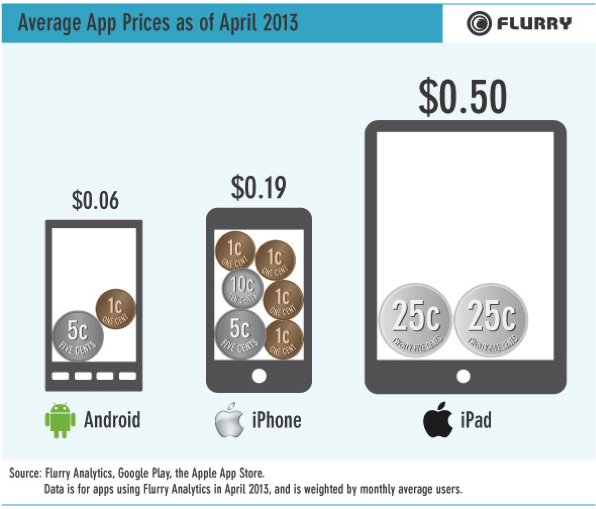 According to a study conducted by Flurry (April 2013), iPhone users are willing to pay 3 times more for apps than Android users. Moreover the study indicates that iPad users are willing to pay 8 times more for an application than Android users. The iPhone and iPad users’ willingness to pay for applications could be linked with the much higher average price of these devices compared to Android. It therefore seems that if you want to monetize your app via in-app purchase or through sales, an iOS application would apparently be more profitable than an Android application. However, we do not have any data on advertising revenue generated by apps. The figures we have are therefore biased by the lack of information on this type of income that can actually be an important source of revenue. If the main objective is only brand awareness and not monetization, an Android app may be more interesting to develop. It is important to keep in mind that there are a lot of devices with different screen sizes running on Android. However, Apple offers fewer devices and therefore, fewer screen variations. This is making things easier for developers as they don’t need to adjust their apps on different screen sizes. So…Apple vs. Android: which one to choose? It seems quite difficult to choose between developing an iOS or an Android application. Many factors have to be taken into account. For example: the targeted countries or the application objectives (branding, income generation, consumer engagement, …). There are still other factors that may influence the choice of developers but these would be too long to outline in this post. The important to remember is that there is no magic recipe. This kind of decision has to be carefully taken and be the result of a serious study. Are you an app developer? What is your opinion on the subject? What App Store are you on, and why? Share your story in the comment section below, we’d be glad to hear from your experience! By Laurie Galazzo, in close collaboration with Sammy Laamari.